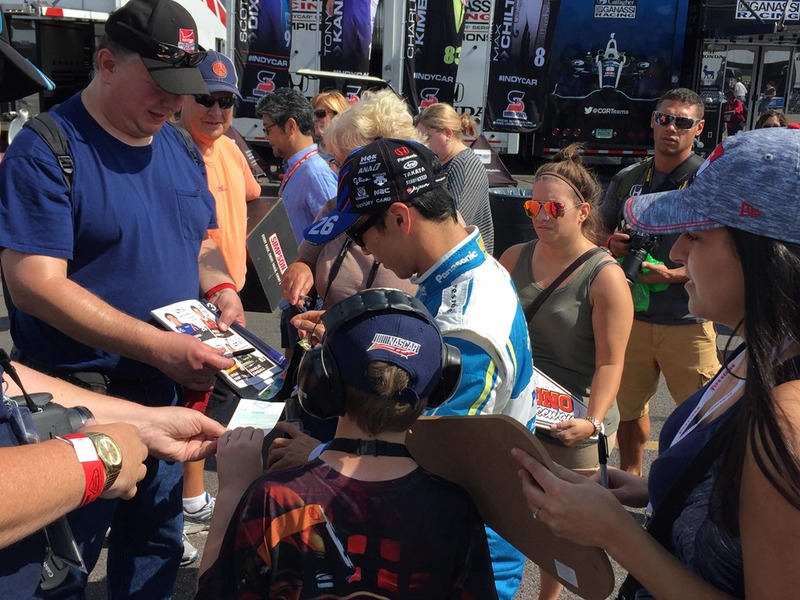 « Welcome To Pocono Raceway! 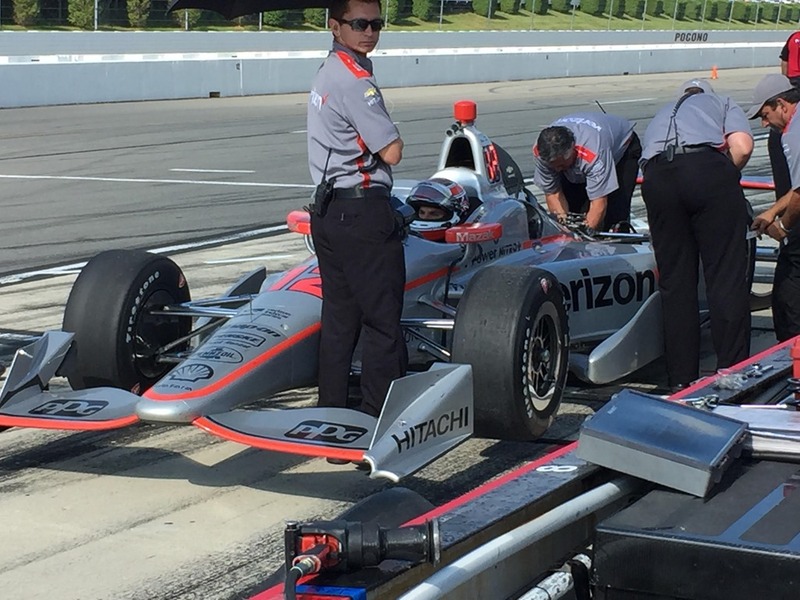 The one and only practice before qualifying for the ABC Supply 500 at Pocono Raceway is now complete. There will be a final practice at 5:00 this afternoon after qualifying at 1:00. The seventy-five minute practice had three caution periods totaling a little over twenty-three minutes of precious practice time. The first was for a routine track inspection. Unfortunately, the other two were for accidents. The first was when Ed Carpenter lost the air to his front wing coming out of Turn Three, when Graham Rahal cut across his front to head for the pits. The car spun and Carpenter hit the inside wall causing fairly significant damage to his front end. I walked through the paddock after practice and the his crew was thrashing to get his car repaired before qualifying. The third caution was for Ed Jones who spun coming out of Turn Two and brushed the SAFER barrier just enough to do damage to the nose of his car. It was later brought into the garage area on the hook. 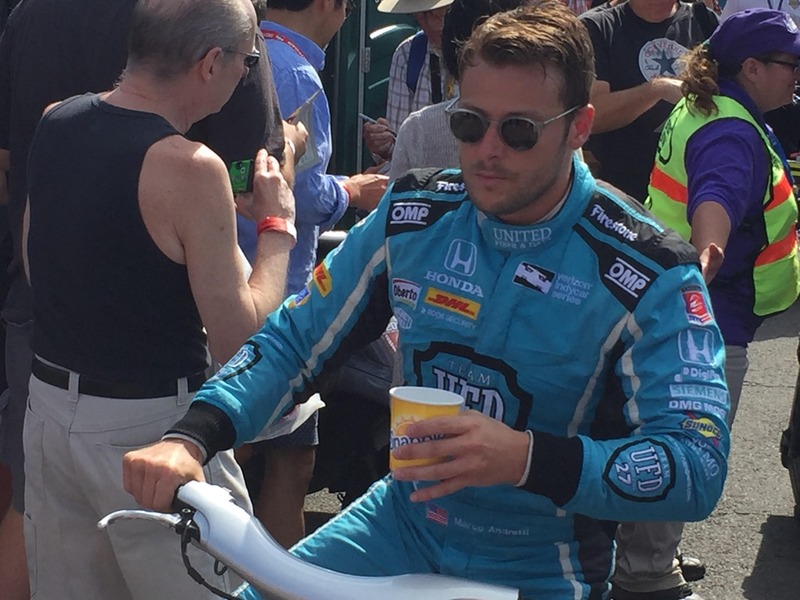 Marco Andretti sat atop the speed charts for most of the session, but the session ended with with his teammate Ryan Hunter-Reay with the fastest speed at 219.268 mph. 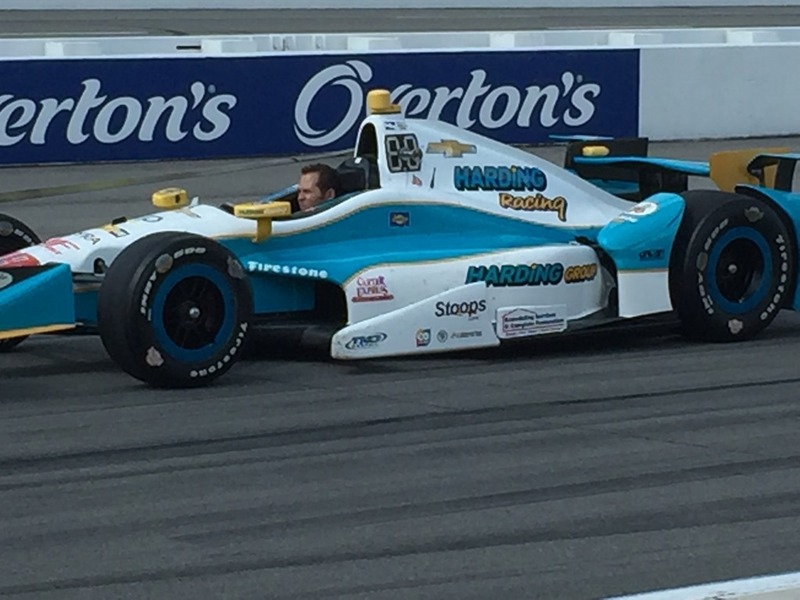 The Chevrolet of Simon Pagenaud wound up second at 219.160. The next sic cars were all Hondas Tony Kanaan was third quick, while Marco was fourth fastest. 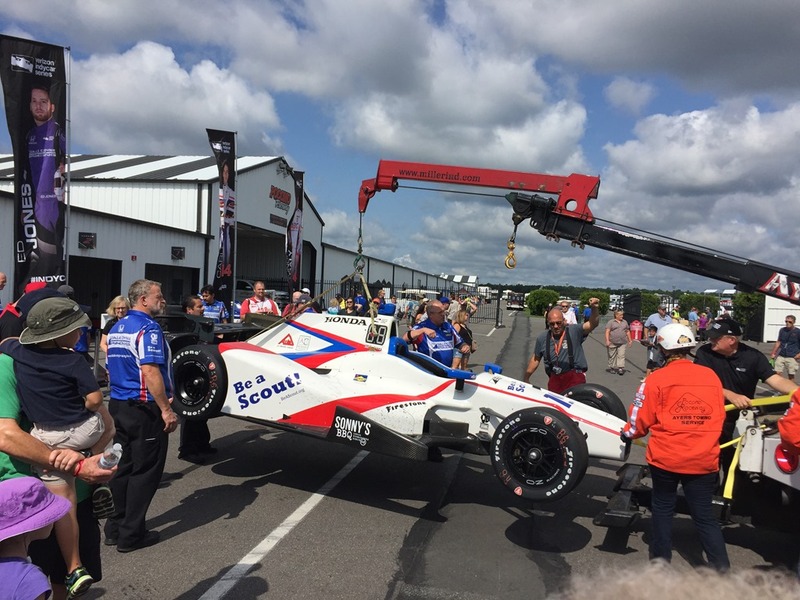 Scott Dixon, Takuma Sato, Alexander Rossi and Graham Rahal were the next fastest, while Helio Castroneves and Gabby Chaves of Harding Racing rounded out the Top-Ten in their Chevys. It’s good to see Harding Racing back at the track. What they have done as a start-up is nothing short of remarkable. I saw Al Unser, Jr. in the garage area working with them like he did at Indianapolis and Texas. 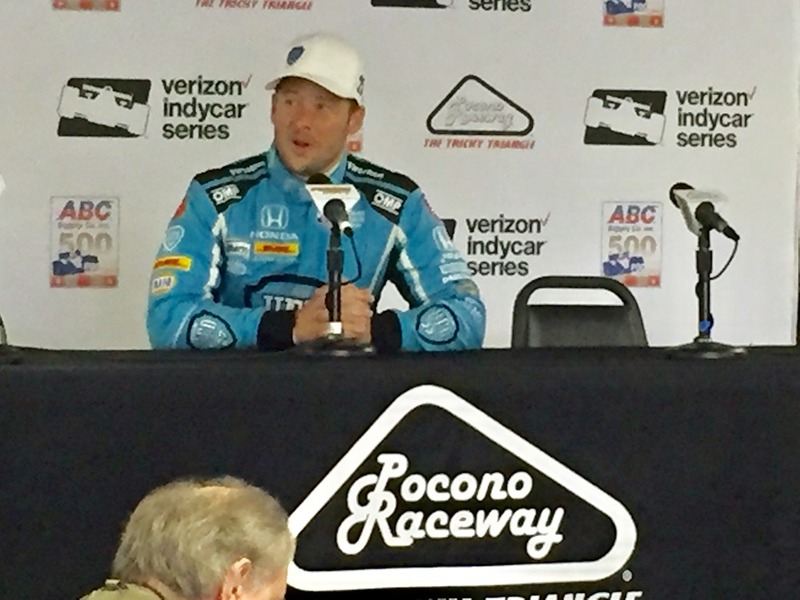 They are still planning on going full-time next season and is now talking about running two full-time cars as well. That’s pretty impressive. I went across the track to the grandstands and shot a short video just to get the full sensation of speed down low by the track. I’ll close for now with a few more random photos from this morning. I’ll be back later in the day after qualifying. Meanwhile, be sure and follow along on Twitter at @Oilpressureblog. This entry was posted on August 19, 2017 at 11:49 am and is filed under IndyCar. You can follow any responses to this entry through the RSS 2.0 feed. You can leave a response, or trackback from your own site. Nice job sneaking into the background of Marco Andretti’s interview, George. I just saw it when someone sent it to me on Twitter. It wasn’t a very flattering look. George, did you pick up on SPM going to four cars next year? Apparently Sam told Robin Miller that.